Once upon a time, New York had two Finnish neighbourhoods – Finntowns. We talk to a couple who used to live in one. The Manhattan skyline rises across the river from Brooklyn, where vestiges of Finntown still remain in the Sunset Park neighbourhood. More than a century ago, working-class Finnish immigrants brought their culture into two New York City neighbourhoods. We talk to a couple who lived in New York’s Finntown in the 1950s. In the late 1800s, Finns found their place in the world’s most famous collective of expatriates: New York. Driven to the US by job opportunities and the image of America as a cornucopia of wealth, they established working-class communities in Harlem and Brooklyn’s Sunset Park. Finns constructed co-op buildings, opened Finnish-speaking businesses and established community centres, churches, newspapers and political groups. By the 1920s, New York was home to roughly 20,000 people who identified themselves as having Finnish heritage. Now the number has dwindled to 3,500. The first of New York’s two Finntowns was in East Harlem, where a stretch of 125th Street between Fifth Avenue and Harlem River was dotted with Finnish businesses during the first half of the 20th century. There were jewellery shops, clothing stores and restaurants as well as a bakery and a beauty parlour. Several Finnish clubs and associations were established; the most notable was Fifth Avenue Hall on the corner of 127th Street and Fifth Avenue. Starting in 1917, it formed the headquarters of a local Finnish Socialist party, but many without political affiliation used its billiards room, library, restaurant and dance hall. Expats mingled here on weekends, and romances sparked; many met their future partners at community gatherings. Among these couples were Anja and Mauno Laurila, who both moved to the US in the 1950s and met at a party organised by a mutual friend in Harlem. By the time Anja moved to New York, Fifth Avenue Hall had already closed, immigration was slowing down and Sunset Park had taken over as New York’s remaining Finntown; when the couple got married in 1958, they too relocated to Brooklyn. In 2011, aided by the last remaining funds of Brooklyn-based Imatra Foundation, the couple chronicled Harlem’s Finnish history in a book entitled Memories of Finnish Harlem: 1888–1955. Compiled from interviews with about ten former inhabitants of Finnish Harlem, the 48-page book forms a portrait of a self-sustaining community that assisted new arrivals in finding employment, was active in entrepreneurship and sustained a lively social scene with athletics, theatre activities and a church. Finnish men worked in construction, in the military or on merchant ships, while women often found a career niche as housekeepers at wealthy local families. Anja, for example, worked for John D. Rockefeller, Jr. Almost no visible traces of Harlem’s Finnish past remain, but many of the buildings that housed shops and community centres are still standing. More obvious, if small, signs of a Finnish past are found in Brooklyn, where Finns built about 25 cooperative (resident-owned) housing complexes. 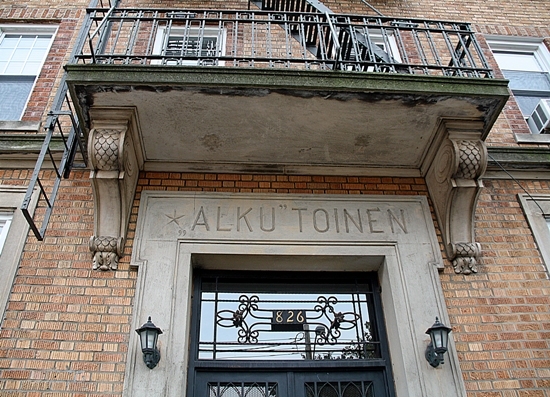 The first Finnish-built co-ops in Sunset Park, named Alku I (Beginning I) and Alku Toinen (Beginning II), date back to 1916 and are the oldest nonprofit co-ops in New York. The entrance of Alku Toinen on 43rd Street has become an emblem of immigration history, mentioned in local newspapers. 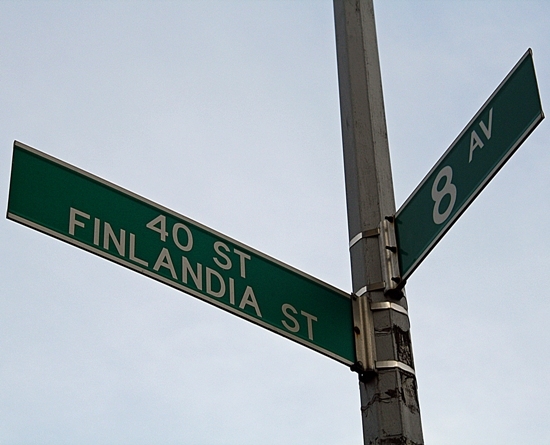 The street sign on the corner of 40th Street and 8th Avenue reads “Finlandia Street,” but no Finnish businesses or organisations remain in the neighbourhood. According to Mika Roinila, a US-based geography professor who specialises in Finnish migration, Finnish cultural communities in New York have dwindled because of a cultural tendency for assimilation. These days, many Finns who come to the US participate in high-tech fields rather than blue-collar jobs. According to sociologists, white working-class communities are more likely than middle-class communities to retain connections to their cultural roots. 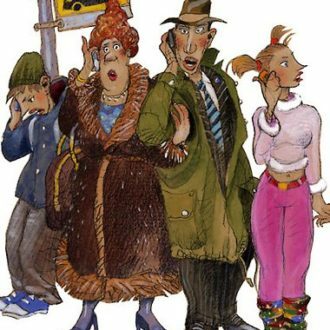 Roinila adds that in many Finnish immigrant families, parents encouraged their American-born children to speak English from a young age in order to assimilate better.